Qalculate! 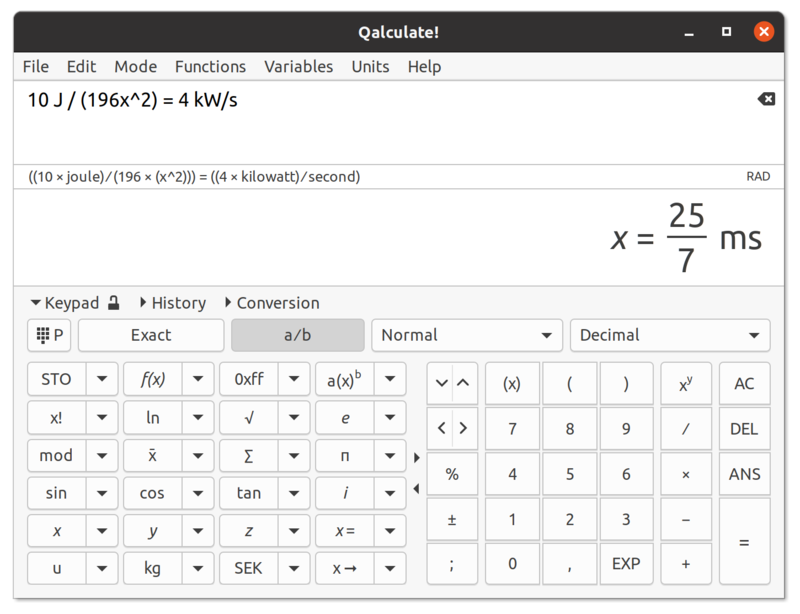 is a multi-purpose cross-platform desktop calculator. It is simple to use but provides power and versatility normally reserved for complicated math packages, as well as useful tools for everyday needs (such as currency conversion and percent calculation). Features include a large library of customizable functions, unit calculations and conversion, physical constants, symbolic calculations (including integrals and equations), arbitrary precision, uncertainty propagation, interval arithmetic, plotting, and a user-friendly interface (GTK+ and CLI). Qalculate! is free software, licensed under the GNU Public License v2 (or later). This project welcomes new developers. Visit the project page here. Calculation of Si(), Ci(), Shi(), and Chi(). Convert trigonometric arguments to selected angle unit, and hide angle unit in result. Hide optional arguments, with default value, in output. Add optional variable value argument to diff(), for calculation of derivative for a specific x value. Improved output with show ending zeroes activated. Fix ignore system language on Windows. Fix atomic unit of velocity. Fix and improve keypad menus, and add dynamic convert to menu to result popup menu (GUI). Fix compilation errors because of erroneous limits.h inclusion. Fix "factorized result is wrong" error. Minor bug fixes and feature improvements. For details see the changelogs for libqalculate and qalculate-gtk. Get the new version from the downloads page.